The masters of Shaolin Temple Kung Fu Academy China is a martial arts family, They generations practicing Shaolin martial arts from an early age..
Grandmaster Chen Cheng Wen was born in 1926, the famous 'martial arts village' - Shutanggou village，DajinDian town, Dengfeng City, Henan Province. Childhood with Shaolin martial arts master Li Gen Sheng learning martial arts, won the true mass, good Dharma stick, meteor hammer, Shaolin stick work, Shaolin boxing and so on. In 1996, the national martial arts competitions, nearly 70 years old Mr Chen also won the first prize, and was named "Top Ten Shaolin Old Boxing Master." Chencheng Wen writing of "Shaolin boxing", "Shaolin martial arts teaching" and other martial arts classics. 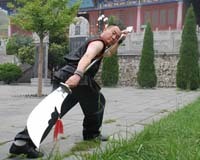 Master Chen Tong Shan (Master Shan), bachelor's degree, was born in June 1965, the famous 'martial arts village' - Shutanggou village，DajinDian town, Dengfeng City, Henan Province. 1999 graduated from the Economics and Management Department of the PLA Air Force Political Academy. Dean Shaolin Temple Kung Fu Academy, Dengfeng City CPPCC members, professional and technical talents in Dengfeng City , Dengfeng City folk culture heritage , Dengfeng Shaolin Wushu Association , vice chairman of the Standing Committee of Zhengzhou City Wushu Association , Chinese martial arts seven segment . Master Shan was born in a martial arts family , six -year-old began to learn martial arts . 1979 for the first time to participate in Dengfeng City Martial Arts Games that made ​​outstanding achievements ; 1980 was elected to the physical culture and performances organized team squad to the major cities of martial arts ; 1983 entering any school sports school Dengfeng martial arts instructor ; 1985 into the Shaolin Temple Kung Fu School faculty ; 1986 Dengfeng Municipal People's Government , was awarded "Top Ten young boxer " honorary title ; 1987 in Dengfeng Shaolin martial Arts Games , won first place in the coaching staff ; 1988 was hired as Shaolin Temple kung fu school principals ; Henan Luohe martial arts competition held in 1991 obtained boxing , broadsword , cane three prize ; National Wushu Competition in August 1991 , held in Tai'an, Shandong won the first prize ; 1991 September at the First China Zhengzhou International Shaolin Wushu Festival was awarded first prize in the long weapon . Master Shan to promote the Shaolin Kung Fu as any, Shaolin martial arts group founded in 1993 , not only for domestic and foreign tourists performances, but also has visited more than thirty countries , Malaysia , Singapore , the Philippines , South Korea , the United States , Hong Kong, Taiwan, and region , for the dissemination of Shaolin kung fu , so make a contribution to the world of martial arts . Master Chen Tong Chuan ( Master Chuan ), Chinese Communist Party, was born in 1967, the famous 'martial arts village' - Shutanggou village，DajinDian town, Dengfeng City, Henan Province. hinese martial arts sixth , currently executive vice president of Shaolin Temple Kung Fu school and head coach . Master Chuan was born in martial arts family , learning martial arts since childhood , in 1978 with his brother Chen Tong Shan in the village martial arts class pass power to grant technology ; 1980 was hired Dajindian Township Shaolin Wushu coach ; due to the excellent work, outstanding achievements , 1985 was registered The first letters of formal martial arts Shaolin Temple Kung Fu Academy Distinguished College as head coach so far. During his tenure, while committed to the martial arts education, while never stopped practicing martial arts , but also often participate in national competitions and promote large-scale martial arts Shaolin martial arts activities. 1992 , was held in Lianyungang, Jiangsu Province National Wushu Competition in the soft weapons first ; 1996 , held in Zhengzhou National Wushu Competition dual soldiers for long , soft soldiers two first ; 1997 , by the State Sports General Administration Professor delegate went to Brunei Darussalam Brunei Prince ( Foreign Minister ) Shaolin Kung Fu ; 2000 , organized the first national in Dengfeng Shaolin boxing martial arts Shaolin boxing contest won first place . Chen Tong Chuan martial arts teaching career at the dedication, due diligence , and trained more than 30 countries over the champion , the institute for the major transport a large number of excellent martial arts talent. 1999 awarded the "Shaolin eighteen King Kong" honorary title Dengfeng Shaolin Wushu Association . 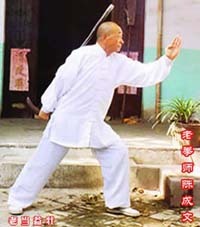 Master Shi Xiao Hu The common name Liu Zhendong, was born in 1991 Songshan Shaolin Temple Kung Fu Academy. His father Liu Xiu, won the National Wushu Sanshou champion, engaged in teaching martial arts in the school. Due to environmental influence, monasteries among the early age became interested in martial arts. 2-year-old will stretch long kick boxing, along with "Hey Ha" Voice of milk and milk sound of gas, one by one, like a decent, quality has to learn martial talent. In his father's words and deeds, that is learned through 5 years old back boxing, Shaolin boxing, and other small Fist routine. 1999 officially into classes, and the 29th-generation Shaolin Temple worship connection successor Shi as a teacher, by the interpretation given Farmington Tigers.